From NTT's Showroom In Tokyo: Futuristic Remote Collaboration Apparatus "t-Room"
Here’s the fourth (and final) demo I witnessed at NTT‘s showroom “Note” [JP] in Tokyo: a futuristic apparatus for remote collaboration and education called “t-Room” [PDF]. While NTT’s Home ICT system, the telemedicine technology, and the digital signage system (now with one more video) were quite impressive, the t-Room certainly boasts the biggest wow factor. The t-Room is essentially a room that consists of multiple video screens and that’s connected to other t-Rooms to share audio and video content remotely (over NTT’s next-generation network). The technology can be used for entertainment, remote education and collaboration, video conferencing, and other applications. Needless to say, all sessions can be recorded for later reference. 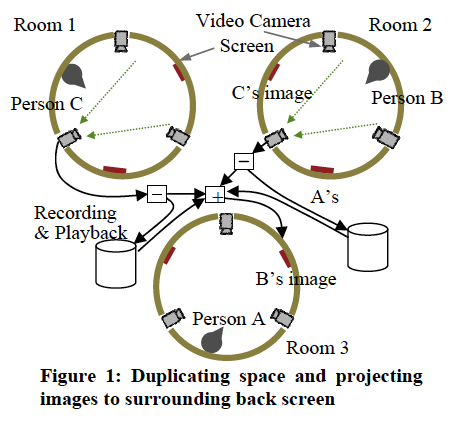 The main difference between the t-Room and conventional video conferencing systems is that the t-room “overlaps” screens, removing (in a way) spatial barriers that separate users who are located far away from each other. And it’s much cooler, too (see the video below).